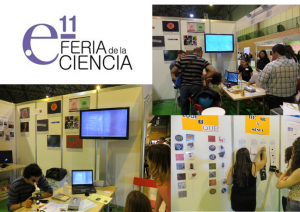 The Science Fair is promoted every year by the Andalusian Society for Science Dissemination supported by the regional government (Junta de Andalusia) and the Spanish Foundation for Science and Technology (FECyT), involving many schools (from primary to high school), Universities and research centers which participate with their own stands. From 9th to 11th May Al-NanoFunc members were responsible for the stand of the ICMS. Different games were prepared to introduce in a simplified way the functioning of the microscopes and concepts like magnification, focus, resolution, field of view. Photographs from Al-NanoPhoto contest were exposed.